Best Doorway Pull Up/Chin-up bar in 2019: What's Most Effective? How do you choose the best doorway pull up bars in 2019 for your needs? We’ve spent quality time to prepare this in depth review to find the best pull up bars for your garage/home gym . Pull up bars enable one of the best exercises for the upper body, pull ups. An effective pull up bar makes sure that you don’t have to go all the way to the gym to get the most out of your upper body workout. And believe me when I say that a pull up is one of the best upper body exercises that are available. While not being a classical doorway pullup bar, this is a lot more effective and easier to setup as well. It consists of 1.5” width thick durable straps with tough buckles on the end, steel pull up bar and metal or wood rings as you like it. If you are travelling, you can pack the wooden rings and it’s a lot easier than carrying around a heavier metal pullup bar. There are some people who suggest that pull ups are mandatory to the upper body as squats are to the lower body. If you aren’t doing pull ups then you definitely need to set some time aside and practice. A pull up is classified as a “multi-joint upper body exercise”. It can work all your upper body muscles, improving their pulling strength, establishing shoulder girdle stability and increased performance through all activities and levels of motion. Pull ups can be performed throughout the year. These are the muscle groups that are worked when you perform a pull up: pectorals - major and minor, trapezius – middle and lower, deltoids, rhomboids, latissimus (lats), biceps, various flexors… So yes, a lot of muscles are involved in just one single exercise! There are alternating phases for the ascending and descending portion. Muscles work concentrically and eccentrically in turns promoting rapid strength gain and quick muscle growth. All said, let’s move on to the instrument that enables this exercise, the pull up bar. Like we discussed before, a pull up is a complete workout of all your upper body muscles. It is usually included in the regimen of all fitness experts and body builders. When you need to get that classical “V” shape, it is imperative that you focus on pull ups as they can streamline the muscles on your torso, front and back. Pull up aren’t easy, and if you can’t do many at one go, don’t be discouraged. If you keep at it though, you will build enough strength to belt them out a dozen at one time! And all through this, your body is getting much fitter, muscular and strong as well. Pulls ups are a big part of your core development as well, so you should definitely focus on this exercise to give you ample core strength. When you get stronger at pull ups, you can also execute other types of exercises like hanging leg raises and reverse shoulder shrugs. These will become much easier when you are competent at pull ups. And once you’ve accomplished all that you’ve set out to do, there are chin ups as your next step to master. These are not more difficult than pull ups, just that it engages different muscles and it takes time to get used to. But pull ups are definitely the best way to get used to other exercises that involve hanging down with your arms. Using body weight as a factor, pulls up are definitely going to build a lot of lean muscle mass. Pull ups activate shoulders and your back. Given the fact that a lot of us work at desks, it does a lot of damage to our posture. Because of muscular and cardiovascular gains, you will feel better throughout the day. This is the age old debate a lot of gym-goers and fitness enthusiasts have. Both movements are great for building core strength and are somewhat similar in action. But when it comes down to it, they vary in difficulty and muscles worked. Generally speaking a chin up is an easier version of the pull up and if you aren’t used to these types of exercises, then you’d do well to start off with chin ups first. Since the palms are pointing at the body, a chin up relies more on the biceps and forearms rather than the complete upper body, and this means that if you’ve got strength in the arms, you can easily accomplish this movement. On the other hand, when you’re talking about a pull up, the grip is away and therefore a lot more engagement of the upper body when compared to the chin up. This results in the exertion of the latissimus dorsi muscle group present in the lower back and the larger muscle groups in the front torso. Still another variation is the parallel grip or neutral grip, which focuses on the brachiordialis muscle which is part of the forearm. Regardless of which is easy or difficult, it’d be good to do everything as a part of a regime. While pull ups are not the most glamorous exercise, it is definitely one of the most effective exercises at building upper body strength. For most people, lifting their own body weight with just their arms and shoulders can be a huge task. This is understandable and one needs to work towards the goal of eventually doing this unsupported. Pull ups are the easiest way to build up upper body strength quickly. Not only do they just give your arms and shoulder a boost, they also work on the entire upper body as well, like arms, back, and abdominal strength. It even increases hand and finger strength to a huge degree. The best part of pull ups is the fact that it can be done even at your local park. You don’t even need a dedicated gym membership to get the most out of your pull up fitness. There are more than a few common factors when it comes to choosing the right pull up bar for your home gym. The basic necessities of performance and durability should be checked so that you know you are getting a great deal and it won’t give out on you. 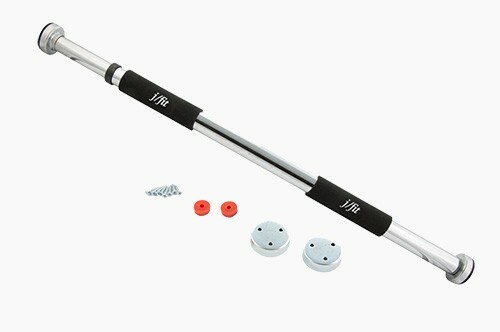 Door jamb pull up bars are very popular among home gym owners. Let’s check a few things that need to be in consideration so you can select the best bar that you need. This directly dictates how durable the bar is. 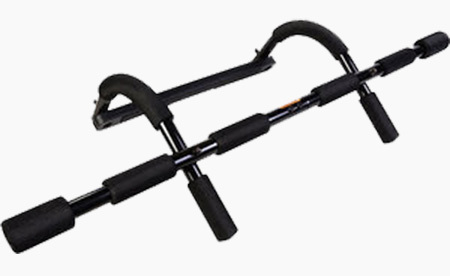 Most of the top pull up bars use hardened steel which feels good to hold on to as well as giving you more durability for the amount of money you are willing to spend. Choosing a bar with a lot of variety on grip is definitely necessary for getting more types of workouts in. A bar with a lot of different set ups means that it does more for the money you paid for it, which is great. A primary concern with most people who are getting a pull up bar is the method of how it is attached to the door jamb or door frame. The best pull up bars makes sure that they are attached to the door without causing any marks to appear or problems. This is how much weight a pull up bar can take before it gives. In the best pull up bars, it’s usually a value between 250 – 300 lbs. Telescopic bars are usually on the lighter side and top out at about 220 mark. The thicker the bar the more your arms will work better. 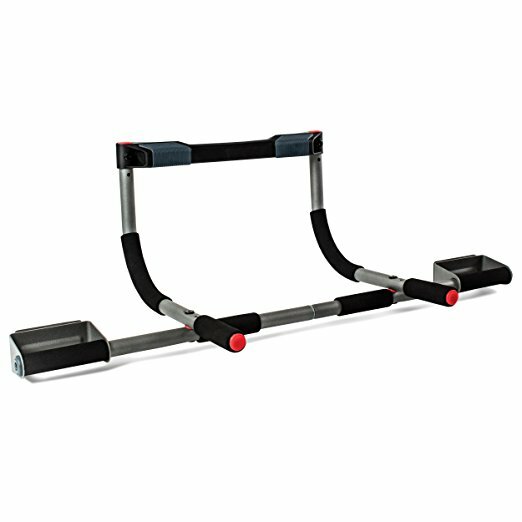 Most of the best pull up bars in the roundup offer premium thick bars that will give you the workout you are looking for. Door mounted pull up bar have their strength and their weakness. Sometimes it might not be conducive to get yourself a doorway pull up due to several reasons. This might or might not be applicable to you but to make the best decision for yourself you need to be aware of the following problems that can occur. Most doors have a standard width of 34 inches and you will have most bars that adhere to that standard. The problem arises when it the doorway is of nonstandard width, meaning you won’t be able to find the right type of pull up bar to fit your doorway. The only solution here would be to opt for telescopic pull up bars, which can fit wider doorways. This is a relevant issue if you are living with a strict landlord. Regardless of what the pull up bar advertises, there will be abrasions and damage when you use a pull up bar. On weaker door frames sometimes after a period of time it might warp so much that it will show noticeably. The solution to this is to opt for methods to reduce damage on the door frame or wall. There are a lot of variations to the standard pull up movement which is practiced by people. Sadly, with the doorway pull up bar, you will not be able to execute any of them. This is because any non-uniform lateral movement will translate into dislodging of the pull up bar causing injuries. So you need to be careful with movements other than vertical. Every gym that is worth its salt has a pull up bar which most of time is occupied by another gym-bro. There are not many different types of pull up bars in the gym. Wall attached is one type, another would be part of a squat stand. But when you are looking at pull up bars for home gyms, there are many types that are used by people who practice fitness at home. Home pull up bars are a popular piece of equipment because they don’t need much of an investment. With some of the equipment here, you need to make sure that you have a compatible pull-up bar door frame. These are the simplest and most common type of pull bars that are in use today. They work on the principle of leverage, with your weight acting on it. They go over the door frame and are curved so that they exert force in both directions. It usually comes in a package with some assembly required; the better brands even have a spanner included. It is pretty simple and assembly hardly takes more than 15 minutes. Since its compact, you can store it easily as well. These are the most popular types of bars owing to the fact that they can be used on standard door frames. Also, these are easy to get on and off your door frame and sturdy. The best doorway pull up bars are made of durable material and last a really long time. These are also known as telescopic door frame pull up bar or doorway chin up bar. They work through a mechanism of a screw as in when you twist them they travel outwards. This is normally wedged between the door way and relies on friction to keep it in place. They also have mounting cups/brackets that come with it. And if you are going to use them you might need to screw them in. Otherwise, these are ready to be used straight out of the box. Door frame pull up bar is the most common of all the types. For a telescopic chinup bar doorway widths are usually not a problem. These are a no-nonsense solution to your pull up bar needs. It mounts directly on to a brick wall or plaster with brackets and screws ensuring strong grip. This is pretty strong and can last a fair bit as well. The only downside to this is that you need to allocate some space for this piece of equipment because you can’t move it around or store it. This is another variation that needs a bit of space to function but can be used for more exercises rather than just pull ups. You can move this around and it keeps steady during your workouts by having a large enough footprint. These are mounted directly on the door itself or 2 doors that are side-by-side. Door pull up bar is used when you have doors that are built strong and can take the weight of your body. It is a pretty useful piece of equipment because door pullup bar don’t require too much space or a strong door frame. Another variation of the pull up bar is to get it mounted on your ceiling. Obviously, this can take a bit of work but is a good example of space saving design and can minimize clutter at ground level in your home. These are effective but you might need to have a low enough ceiling to be able to use it effectively.Now that we’ve discussed about the different pieces of equipment that you can use to perform pull ups, let’s get to know the best of the lot. So here we break it down according to various people who have tested these pieces of equipment for extended periods of time. Choosing one based on these reviews will give you the best option for your upper body strength training. 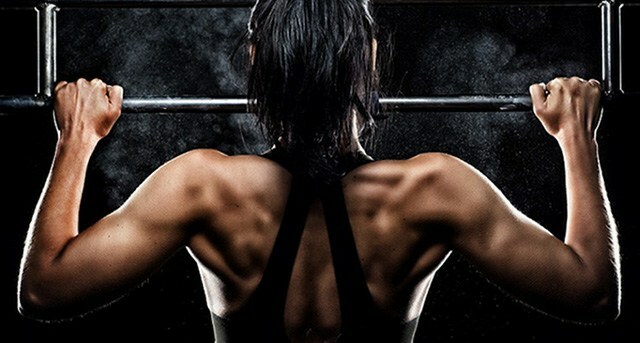 The Iron Gym pull up bar is the one that came out on top when compared to all the rest. The reasons for it performing so well is due to the fact that it gets the basics right. It has a solid build, has multiple grips so it’s vastly functional. It even includes the ability to use it to perform sit ups or pushups depending on how you want to use it. It has a robust all-steel construction, comes with its own assembly tools and its grips are comfortable. On the whole Iron Gym Extreme pull up bar is a pretty impressive entry into the world of doorway fitness pull up bars. For extreme ease of use and still providing value, Sunny Health and Fitness Doorway chin up bar just can’t be beat. What we found the most impressive was the heavy duty build, this thing can support up to 220 pounds, which is saying something for a simple telescopic doorway chin up bar. It comes with no lip foam grips that can save your hands while getting your focus on the exercise movement. Unlike the other telescopic bars we tested, the Sunny Doorway Chin Up bar felt like part of the door frame, it’s that stable. With this, you can actually move it a lot lower to secure your legs for sit-ups. Or, you can use this for pushups. This is one of our favorites and for good reason. It is a much less expensive proposition and it makes a lot of sense as a purchase. Granted, it might have a few types of grips lesser than the other multi gym pull up bar in this review, but you get so much more. The tough construction, good quality grips and it comes with pads that don’t scrub your door frame off. The USP of this perfect pull up bar is the fact that it comes with true wide grips that extend to way outside of the door frames which can give you a much better workout. 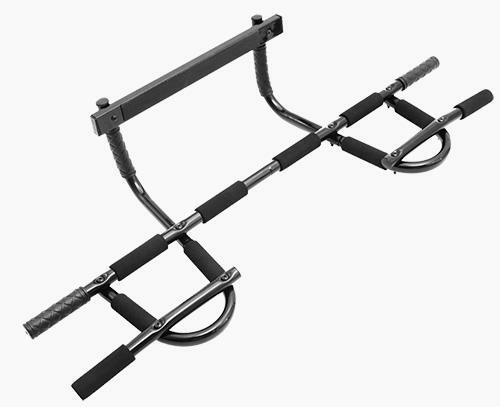 Perfect fitness pull up bar is an excellent piece of equipment. This is one of those units that just missed out round up. It isn’t because it’s a bad piece of equipment per se, just that the rest of the competition has gotten really good! 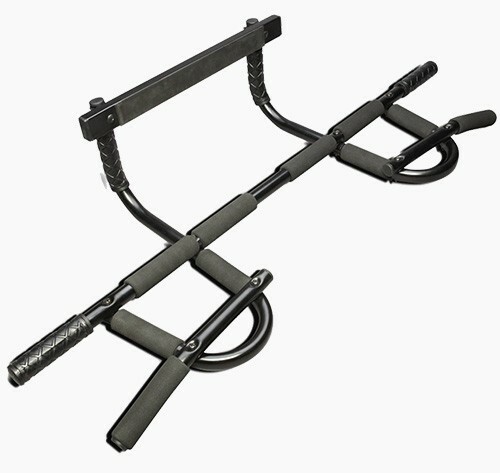 Another solid performer when it comes to traditional doorway pull up bars, it also comes with an extra wide grip which can help you get the most out of your pull up session. The catch with this is that you might need to have some sort of frame moulding on top if you don’t want to use screws to install them. Another pull up bar for door, which also offers a lot of different grips for the user. Its construction is heavy duty so you don’t need to worry about this sagging in the middle even after you use it continuously. Its grips are comfortable and easy to grip. All things considered, this is a great product and if you are willing to pay the premium, this will serve your fitness needs for a good amount of time. 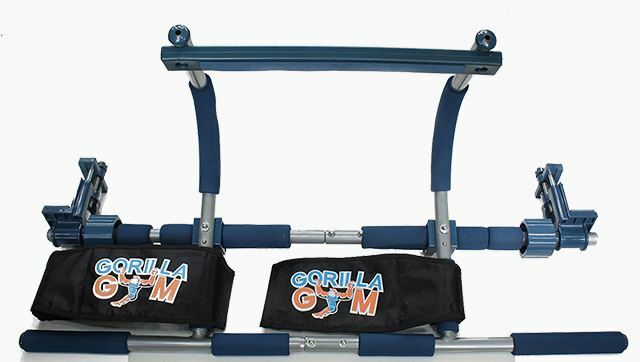 An interesting package, the Gorilla gym power fitness package comes in an attractive blue color and is the only doorway pullup bar certified by the ATSM as safe for children to use. Because it is designed so that kids and use it to swing as well, it enables many exercises and movements that can help develop their core at a very young age. It’s built very well and definitely not just for kids when it comes to the rough and tumble of fitness. Definitely one of the better pull up bars in here. 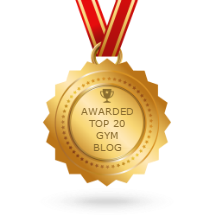 Certainly one of the leaders in the domain of fitness, they have been a household name since a really long time. They have also expanded into the home gym market and this is reason for celebration for all home gym owners. Certainly built to last, Gold’s gym training bar comes sturdily built and has foam grips that are comfortable to hold even if you’re really heavy. This is probably the only bar with 10-year warranty on it and even has videos which have workout advice and routines. 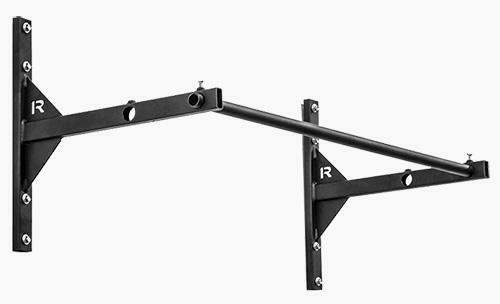 This wall mounted garage pull up bar is built solid like most other products from Rogue fitness. It is built with 11 gauge steel and it feels like it will not give despite the heaviest loads. It is also a bit expensive and is meant for people who are really serious about gym training. 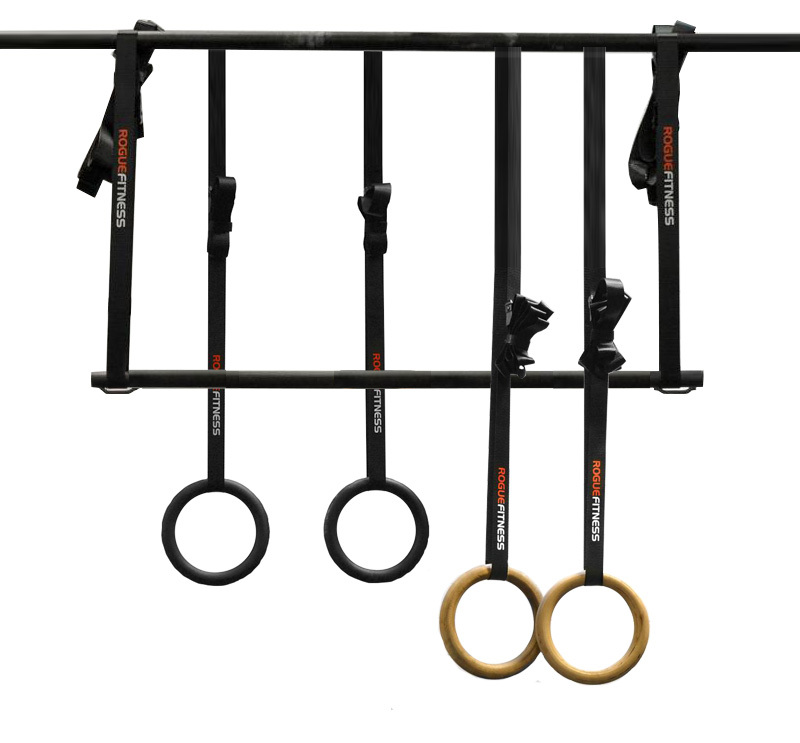 Rogue fitness pull up bar is made to last and offers great performance. 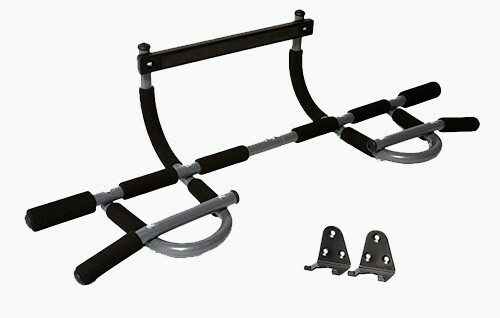 The cheapest garage pull up bar package includes the P-5V Garage pull up system and a pair of brackets. One of the best pull up bars out there, J-Fit is of the telescopic variety and offers premium grade strength and is extremely easy to put up and store after you’re done. It also comes with safety caps which can help increase grip when you attach them to the door frame via three screws. The J-Fit pull up bar has a longer than average reach which makes it ideal for door frames that are extra wide. This is probably the only one where we have seen fit a really wise 40-inch door. This makes a lot os sense as a home gym buy. There might be many times when a door way pull up bar might not be suitable. For those kind of circumstances is there alternatives that you can use? There are quite a few alternatives that you can use. All you really need is a ledge or something that you can hang off. You can use this to your advantage and make sure that you get the required pull up movement in. You can use several things from pull up resistance bands which you can mount on a closed door. Or even use the door itself, strong doors can take the weight and will offer you great support as well. If you have one of those types of houses which have exposed beams up top, then use them to your advantage. They are quite strong and will View more door pull up bar. Hopefully by now you have an idea about what to expect when you consider doorway pull up bars. This review was aimed at all levels of people, people who know about it, heard about it and use it. People who already own pull up bars; hopefully you might find have some more tips and tricks which can help you out with the exercise regime that you are on now. The rest have, with a bit of luck, found the right ones that can work for them and that are compatible in their home. Pull ups and chin ups are exercises that everyone needs to get done when they’re at the gym. Hopefully after this article you know what you should be getting for your home or gifting a friend. A pull up bar can definitely give you the kind of workout you are looking for. If you enjoyed this perfect pullup review, then do share this with people you know. If at first you are not able to do too many, don’t get discouraged! Keep at it! You are bound to get more repetitions in later as you become stronger and fitter.